The Race Always Goes On. Just two short weeks ago, Jack Brabham had held Stirling Moss’ badly injured body as he waited at least a quarter of an hour before an ambulance arrived. Mike Taylor suffered career-ending injuries on his own sprint back to the pits to get help for Moss. The next day, Alan Stacey and Chris Bristow were both dead. Just as it does at the end of every weekend for the past 63 years, the F1 circus closed up shop and moved on. Just two weeks ago, the driver’s watched their ranks thin due to injury and death. Remember, flames back at Spa could be seen from one of the crashes lap after lap. And yet, in their quest for speed, the season continued into champagne country. 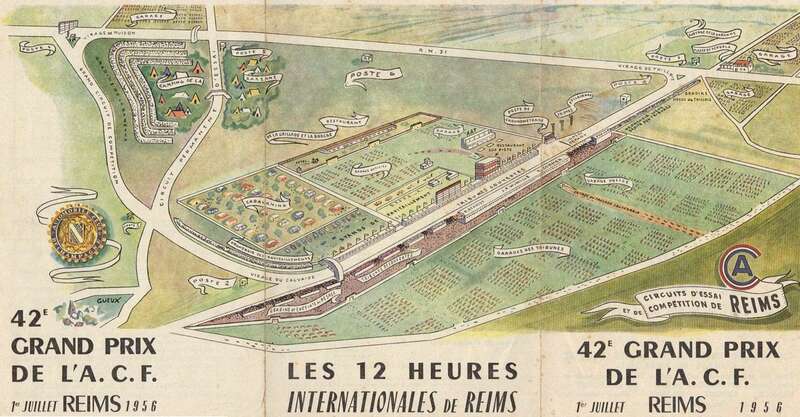 This layout from a 1956 endurance race is the same as the 1960 French Grand Prix. The 1960 French Grand Prix. As the track map suggests, the 1960 Grand Prix at the Reims Circuit was all about high-speed action and slipstreaming. The screaming engines would have howled into the countryside. Needless to say, the engines and transmissions took a thrashing. Jack Brabham took his second pole in a row, averaging 135 miles per hour. Phil Hill, the American, managed to take the second grid position Scuderia Ferrari D246 F1. Graham Hill, in a BRM, was third. Brabham was quickest off the line. Hill briefly fell to third. Soon therafter, Hill was nipping at Brabham’s heels. Hill’s front-engined Ferrari dueled Jack Brabham’s mid-engined Cooper lap after lap on the indiscriminate Reims circuit. Hill was forced to retire on the 29th lap. Brabham’s speed was dominate. He won the race by a Vettelesque 45 seconds. Bruce McLaren was third behind Gendebien, another Cooper-Climax driver. In fact, only Coventry-Climax engines managed to finish the race. Eoin Young, in his biography about Bruce McLaren, notes that 100 bottles of champagne went to the fastest man in practice, each day. To me, this fact highlights the–at times–short memory of the Formula 1 racing. In a forward-looking sport, there seems too often to be too little room for reflection. Perhaps, this is best. In life as in sport, perhaps there comes a time when each of us must inevitably step up, pick up the pieces, and drive on. David Hayhoe and David Holland, Grand Prix Data Book: 1997, 102 (Duke 1996). Eoin Young, McLaren Memories: A Biography of Bruce McLaren, 90-93 (Haynes) (proving to be an epic account of this era of races). Aaron and Hughes, The Complete Book of Formula One, 96-105 (Motorbooks). Wikipedia, 1960 Belgian GP (Accessed November 12, 2013. Wikipedia, 1960 French GP (Accessed November 12, 2013). This entry was posted in 1960 and tagged 1960 French GP, Alan Stacey, BRM, Bruce McLaren, Chris Bristow, Cooper-Climax, D246F1, Eoin Young, F1, Jack Brabham, Mike Taylor, Phil Hill, Scuderia Ferrari, Stirling Moss, T53. Bookmark the permalink.